I married my amazing wife, Jennie, 3 years after graduating college. We had a lot of great times together the next few years, including backpacking around the world for 6 months. We visited 10 countries, met some amazing people and had life-changing experiences. When we came back, it was time to settle in and start thinking about buying a house, eventually having kids, and building our careers. I was doing freelance web design at the time, and my wife was just hired as a third grade teacher. We didn’t have much in the way of savings, but we had a pretty big chunk of debt. This included $5k in credit card debt, my student loan (20k), and 2 car loans (15k). A total of $40,000. I was making an average wage doing freelance web design at the time, and my wife just started her career as a 3rd grade teacher. We didn’t have a ton of money to spare, and we also wanted to buy a home eventually. We rented a small apartment and started trying to figure out how we were going to save up the $30k or so we would need to purchase a home. We are from Orange County, California, so buying a home is a pretty daunting task. The cost of living here is pretty crazy, and saving that much money seemed impossible at the time. On the recommendation of a friend I read a book called Total Money Makeover. It really inspired me to pay off our debt as soon as possible. The premise of the book is to use some basic guidelines to get out of debt, save more, and invest. There are 6 steps in total, but I just want to focus on debt. The second step is called a “Debt Snowball”, and it really works. The debt snowball works by paying off one loan at a time, starting with the smallest. In our case, that meant paying off our credit card debt, starting with the smallest amount. We had a couple of cards with a few thousand dollars each on them. We put as much as we possible could towards the first card until it was paid off. To make the math easy, let’s say we had a minimum payment of $50 and we added another $450/mo towards that card until it was paid off. The first card was paid off in a few months at a rate of $500/mo. One loan down! Next we took the $500/mo we were putting towards that first credit card, and put it towards the next highest debt. In this case it’s another credit card. If you take the $500 from before, plus the minimum payment you were already paying on this new card (another $50), it should be more like $550/mo you can pay down. This is how the snowball works. With each debt you pay off, you have more money to put towards the next debt. At that rate, our second credit card was paid off faster than the first one. We then took the $600 we were using towards credit cards, and went to the next highest debt. When you get to car payments it gets even more fun. Paying off a car loan meant we had an extra $350 or so when we approached the next loan paydown. By this time we were paying off over 1 thousand dollars of debt each month. Using this debt snowball principle, my wife and I were able to pay off $40,000 of personal debt. This included $5k in credit card debt, my student loan (20k), and 2 car loans (15k). It didn’t happen right away, we had to be wise with our spending for about two years. When we paid off the last debt, it felt incredible. Having no loan payments, and being indebted to no one was like a weight was lifted off our shoulders. After that we knew we could never take on bad debt again. 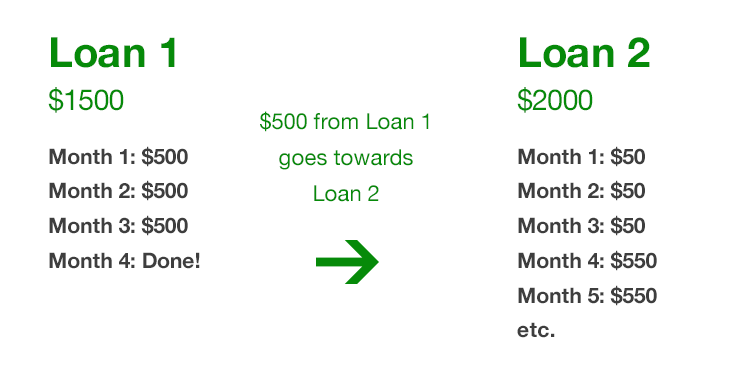 The reason I love this method is because paying off the small loans first keeps you motivated. Some might argue you should be paying off the higher interest loans first, and they’d be right, if humans were all perfectly rational all the time. The truth is that most of our decisions, especially when it comes to spending money, are made emotionally. One of the most important things is just staying on track. Doing a bunch of math on interest rates doesn’t keep most people from swiping their card for an impulse buy. The key is persistence, if you stick to the plan you can slay the beast. Isn’t Investing More Important Than Paying off Debt? Some would say it’s better to get started investing instead of paying off debt. On paper you are right. Making a 7% return on an investment is better than paying off a debt with a 4% interest rate. Leveraging your investments with low interest loans is a great way to build wealth. The problem is that life doesn’t work out as perfectly as our calculations on paper. What happens if you make a bad investment, and lose it all (like many people in 2008)? Then you get fired, your wife leaves you, and the dog runs away. Paying off debt is important because it allows you to weather the inevitable storms of life. If you have no debt, you don’t have to max out your credit cards to pay your bills when things go bad. You can take your time finding the next job, so you don’t have to take something you aren’t happy with. Most Americans are only a few months away from bankruptcy if they lose their job. Unexpected expenses like car repairs, medical bills, and extra taxes will always come. It’s part of the fun of being an adult. If you don’t have debt payments, it’s much easier to find the money to pay these expenses without digging yourself into a hole. Investing is great, but you need to get your financial house in order before you take that step. With no bad debt, you will be able to handle the risks of investing, and weather the storms of life without extra stress. If you stick to it, one day you’ll wake up with no debt, and it will feel amazing. That was a fun and educative read. Thanks for sharing that smart debt payment method! Awesome, and congratulations. Seems like the “low hanging fruit” principle works in debt too. It makes sense that paying off the smaller stuff quickly helps you stay motivated and build momentum… or shall we say, a snowball effect? Thanks for sharing this, I just put this book on my next to read. Cool, hope you like it Oscar! Have to admit, I’ve parted ways with some of Dave Ramsey’s financial advice, especially when it comes to investing. However, I think the debt snowball is the best way for anyone to get rid of bad debt. Yes! Total Money Makeover totally changed the way I think. I still use my Amazon CC here and there but my wife and I are working towards debt-free life now. 1 car loan and 1 student loan to go. Nice Joe, keep up the good work! Nice article on the debt snowball. I’m a big fan of Dave Ramsey too. Something else I recently learned about is how a HELOC can bring down mortgage faster than a conventional loan. It’s not a strategy from Ramsey, probably because having a home equity line of credit for a lot of people is too easy to abuse. But the idea is like this: hopefully, each month you have extra income you set aside that you would never add to your mortgages, because once you do, you could never get that money back in an emergency. However,if you use a line of credit, you have the freedom to put all of your income towards your HELOC. Let say you have a mortgage of $400,000. and then you get a $20,000 HELOC and pay that towards your mortage: bringing it’s balance to $380,000. Then your principal payments will forever be slightly higher. It starts a snowball effect. Then you place all of your income, your entire paycheck on your HELOC, then make withdrawals against it throughout the month as you need it. As you pay off your HELOC, you make another large payment to your morgage and continue all of this until you pay them both off. Mathematically, this is much better, but like your article says, what looks good on paper doesn’t always look good in real life.